How to Apply for CTET 2019, Submit Online application form, Exam on July 07, CTET 2019 Online Application Forms on ctet.nic.in, check eligibility, last date and how to apply here. 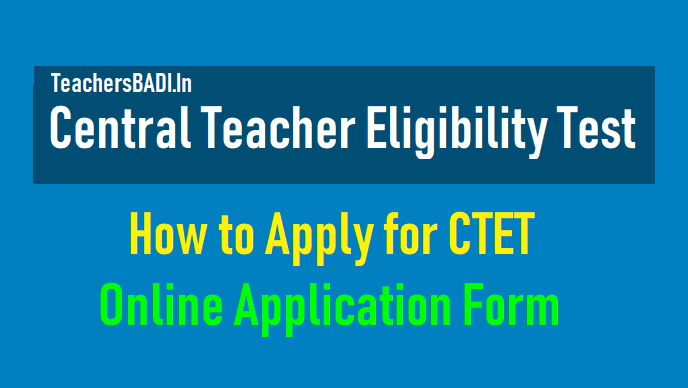 Central Teacher Eligibility Test, CTET 2019 online application forms would be released on the official website ctet.nic.in. As per the official notification now available on ctet.nic.in, the CTET 2019 online application forms would release soon on its website. Check eligibility criteria, important date and last date to apply below. The detailed information bulletin is available on ctet.nic.in. CTET registration last date extended till March 12 for July 2019 exam: The Central Teacher Eligibility Test (CTET) 2019 online registration has been now extended till March 12, 2019. CTET is a teacher eligibility test which is conducted by the Central Board of Secondary Education (CBSE). The CTET examination is conducted twice in a year - December and July. The CTET July exam will conduct on July 7, 2019. The registration of the CTET July 2019 exam will now close on March 12 and the candidates will be able to make payments online till 3:30 pm on March 15, 2019. The candidates can appear for either one of the papers or both papers. The candidates need to have D.El.Ed certification or B.Ed certificate to be eligible to apply for the CTET examination. The CTET July 2019 result date will be notified later on the official website. The candidates who qualify the exam will be eligible to apply for the job in government schools. 1) Registration: The candidates need to submit their personal details such as name, father's name, mother's name, ID card details, mobile number, email ID, address etc. 2) Application form: The candidate need to enter their language preference, Paper apply for, educational qualification etc. 4) Fee Payment: The candidates need to pay exam fee as applicable. The last date of submitting the exam fee is March 15. # Apply online only through CTET website www.ctet.nic.in. # The online application process will started from February 5, 2019. # Fee can be paid upto March 15, 2019 till 3.30.p.m. CTET 2019 Fee payment: The fee payment for the Central Teacher Eligibility Test (CTET) 2019 will be started. All those who have not paid the same may do so at the earliest, at the official website -www.ctet.nic.in. The exam will be conducted by the Central Board of Secondary Education (CBSE) on July 07. A person who scores 60 per cent or more in the exam will be considered as TET pass and the validity of qualifying certificate will be seven years from the date of declaration of its result. CBSE is scheduled to organize the 11th Edition of Central Teacher Eligibility Test i.e. CTET 2019 in two slots viz Paper-II - 9:30 am to 12:00 pm and Paper-I - 2:00 pm to 4:30 pm, for candidates aspiring to serve as teachers for Class I to VIII in schools that come under the purview of the Central Government (KVS, NVS, Central Tibetan Schools, etc) and schools under the administrative control of UTs of Chandigarh, Dadra & Nagar Haveli, Daman & Diu and Andaman & Nicobar Islands, Lakshadweep and NCT of Delhi. The notification would be released soon by Central Board of Secondary Education, CBSE in every year. The notification to be available on the official website ctet.nic.in. Candidates interested in applying for teaching jobs in central government run schools in classes I to VIII are required, by RTE Act, to be CTET qualified.. The last date to apply online for CTET would be ... Candidates can check the important dates for CTET 2019 here. Candidates interested are advised to note that the information bulletin is released and not the application forms. The online application or CTET 2019 registration would begin soon. Sources have suggested that the reason for the delay could be due to the announcement of CTET 2019 examination being conducted in 20 languages. The Central Board of Secondary Education (CBSE) will start the registration process of the Central Teacher Eligibility Test (CTET) soon on the official website, the link for which is ctet.nic.in. According to CBSE, the official organiser of the exam, the registration process for the test has been delayed due to administrative reasons. "The next date will be notified shortly. All the aspiring candidates may watch the CTET website for the date," said a public notification from the Director, CTET. Application Fee: For CTET, applicants shall have to pay Rs. 1200 for both the papers and Rs. 700 if applying for one of the papers. The application fee for candidates belonging to SC, ST and differently abled category is Rs. 600 for both the papers and Rs. 350 if applying for one of the papers. Candidates shall have to deposit the fees with Syndicate Bank or Canara Bank through e-challan. Candidates can also submit the fees through debit card or credit card. Photograph, Signature: For CTET application form, candidates must upload images in the appropriate size and dimension as set by the Board. Size of scanned photograph should be between 10 to 100 KB (dimension: 3.5 cm (width) x 4.5 cm (height)) and size of scanned signature should be between 3 to 30 KB (dimension: 3.5 cm (length) x 1.5 cm (height)). Question Paper Medium: Applicants should note that language of the question paper once set cannot be changed. 'The candidates must attempt questions in languages opted by him as mentioned in the Admit Card. In case the questions are attempted in any other languages, the candidature of such candidates shall be cancelled,' reads CTET notification. A person who scores 60 per cent or more in the exam will be considered as TET pass. Those belonging to SC/ST/OBC/differently abled category will be provided relaxation up to 5 per cent in the qualifying marks in the minimum educational qualification. The validity of CTET qualifying certificate will be seven years from the date of declaration of its result. This year, there were reports that the government is planning to remove Tamil and 16 other languages from NET list of options. After facing criticism by the Opposition, the HRD Minister tweeted that CBSE will conduct exam in all 20 languages. “The CTET examination will be conducted in all Indian languages as was being conducted earlier. I have already directed the CBSE to conduct the examination in all the 20 languages,” Javadekar said in a tweet. Candidates who have completed their Senior Secondary with a minimum of 50% marks and also completed a 2 year diploma in elementary education/ 4 year bachelor degree in elementary education are eligible for CTET Paper I which is for classes I - V. For classes V - VIII, candidates are required to have completed their graduation and a 2 year Diploma or a 1 year B.Ed. The minimum percentage requirement in graduation is of 50%.Please note, relaxation up to 5% in the qualifying marks in the minimum Educational Qualification for eligibility shall be allowed to the candidates belonging to reserved categories, such as SC/ST/OBC/Differently abled. Please note, there is a inimum age limit fo 18 years for CTET but no upper age limit. However, there is an age limit for recruitment in central shools, KVs which would be applicable, irrespective of the candidate being CTET qualified or not. Candidates from general and OBC category are required to pay a fee of Rs. 700 for only paper I or Paper II. In case the candidate wishes to appear for both the papers, he/she is require to pay a fee of Rs. 1200. There is a 50% exemption for SC/ ST and differently abled candidates in the fee. The applicable fee is Rs. 350 for either of the papers and Rs. 600 for both the papers. # The Central Board of Secondary Education will conduct the 12th edition of Central Teacher Eligibility Test (CTET) on 07-07-2019 (Sunday). The test will be conducted in twenty languages in 97 cities all over the country. # The aspiring candidates have to apply online only through CTET website www.ctet.nic.in. # The online application process will start from 05-02-2019. # The last date for submitting online application is 05-03-2019 and fee can be paid upto 08-03-2019 till 3.30.p.m. CBSE CTET 2019: How candidates can complete the registration process: Go to CTET official website, ctet.nic.in, On the homepage, click on "Apply Online", Create your account and note down registration number or application number, Complete the registration process, Upload scanned images of photograph and signature in the space provided, Complete the payment process by e-challan or debit/credit card, Submit the same and take print out of the confirmation page. Step 1: To fill the online application form for CTET, go to the official website ctet.nic.in. Step 2: On the home page, click on the clink – apply Online. Step 3: A new window would open. Click on New Registration, provide details and save the registration number. Step 4: The system would then prompt you to upload the scanned images of latest Photograph and Step 1: Signature as per the size specifications mentioned in the detailed notification. Step 5: Pay the fees either online or generate the e-challan. Once the payment is complete, the online application form is completed. Step 6: Candidates are advised to print and save the filled online application forms for future reference. However, the candidates are not required to send the copy of the form to the CBSE office. CBSE would be conducting CTET on July 07, 2019. The candidates interested in applying for teaching jobs in central schools are required to be CTET qualified for teaching classes I to VIII. As per the latest announcement, CTET would be conducted in 20 languages. About CTET: The CTET shall apply to schools of the Central Government (KVS, NVS, Central Tibetan Schools, etc.) and schools under the administrative control of UT's of Chandigarh, Dadra and Nagar Haveli, Daman and Diu, Andaman and Nicobar Islands, Lakshadweep and NCT of Delhi. CTET may also apply to the unaided private schools, who may exercise the option of considering the CTET. Schools owned and managed by the State Government/local bodies and aided schools shall consider the TET conducted by the State Government. However, a State Government can also consider the CTET if it decides not to conduct the State TET.